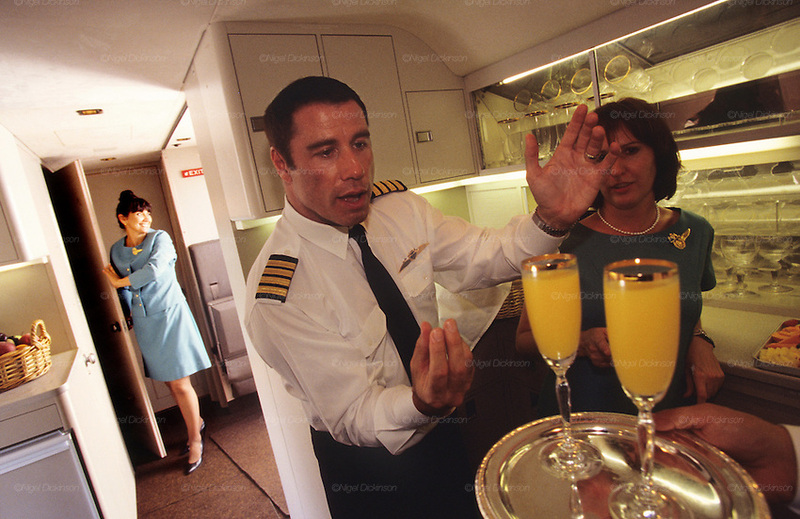 John Travolta, captain and pilot, of his own jumbo jet, involved with his cabin crew, serving and preparing hospitality for his guests...John Travolta is pilot of his very own jumbo jet, a 1964 Boeing 707-100 series. In 2003, John Travolta flew his jumbo jet around the world, in partnership with Quantas, to rekindle confidence in commercial aviation, and to remind us that elegance and style are a part of flying. The crew are dressed in tailor made authentic uniforms from the Quantas museum. The men's uniforms are styled on British Naval uniforms and the ladies' designed by Chanel. His jumbo jet sports a personalised number plate N707JT which speaks for itself. The aircraft is named "Jett Clipper Ella" dedicated to his son and daughter. This jumbo together with his other aircraft are housed in purpose built hangars at his home in Florida, USA.